At THE FLOWER SHOP OF MARGATE, All Floral Orders Are Professionally Arranged and Hand-Delivered to Your Home, Office, Hospital... Anywhere in the Area. Whatever the occasion, send a beautiful fresh or silk flower arrangement that’s custom-made just for you. 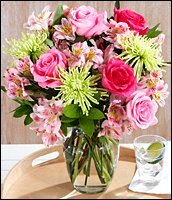 We offer traditional and contemporary floral design styles that are appropriate for all occasions, birthdays, anniversaries, new baby, holidays or just because. and Surrounding South Florida - Broward County area. Whether your wedding or party is formal or casual… a small gathering or the social event of the year… we can help you plan an event that’s a "blooming" success! 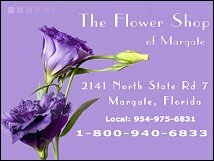 Call The Flower Shop of Margate at 954-975-6831 to schedule your consultation. 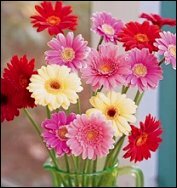 Browse our wonderful green and blooming plant selection for a gift that adds life to any room or office. We also offer gift ideas for any age or occasion: fruit baskets, gourmet baskets, plush stuffed animals, balloon bouquets and more!